Always on Sunday: Europe's official day of rest? unite to promote EU legislation that would make Sunday Europe's official day of rest. the EU Parliament building in Brussels. Some 30 years ago my wife I and had neighbors with a son about the age of our young son. The husband worked as an engineer for the German defense ministry and spent a year with his wife and son in the United States on an assignment at a U.S. military installation. One time in a conversation the couple made an observation about life in the United States that made me think. They said, "Life never slows down in America, because you do not have a real weekly day of rest." Their comment was based on retail sales on Sunday, since shopping centers and stores are open for business on Sunday in the United States. That confused and irritated them, since they were not used to commercial activity on Sunday in their own country, Germany. There are many Europeans who have similar sentiments as our former neighbors from Bonn. The new European Union Lisbon treaty gives its citizens an unprecedented opportunity to present their viewpoint straight to EU decision makers. The Lisbon treaty took effect on December 1, 2009. One of its provisions is the right for EU citizens to petition the European Commission directly with a request for action on a particular agenda item. Article 11.4 of the new treaty says: "Not less than one million citizens who are nationals of a significant number of Member States may take the initiative of inviting the European Commission, within the framework of its powers, to submit any appropriate proposal on matters where citizens consider that a legal act of the Union is required for the purpose of implementing the Treaties." In what might be the first petition to be submitted under the provisions of the Lisbon treaty, concerned EU citizens are collecting signatures for an initiative to have Sunday declared the European Union's official day of rest. What began as a small group meeting at the end of December 2009 has mushroomed into a network of 72 different organizations, including 35 labor unions representing all EU member states and "all relevant churches" in the EU, according to a spokesman for the initiative. On websites like http://www.free-sunday.eu supporters of the initiative emphasize first and foremost the social and labor benefits of a work-free Sunday: "The work-free Sunday is an essential pillar of the European Social Model and a part of the European cultural heritage." A set day of the week provides time for families to be together, for social interaction with others in clubs and associations and even volunteer work for social agencies. Another point emphasized in support of Sunday is the fact that despite of various religious, cultural and ethnic backgrounds within the EU, schools and public institutions like government offices are not open on Sunday and do not plan to be open on Sunday in the future. Emphasizing social and labor benefits of a work-free Sunday is in large part a reaction to a ruling made by the European Court of Justice (ECJ) in November 1996 on an earlier EU Council Directive (93/104/EC from November 23, 1993) regarding "certain aspects of the organization of working time." The Council Directive from 1993 declares in Article 5 concerning a weekly work-free day: "Member States shall take the measures necessary to ensure that, per each seven-day period, every worker is entitled to a minimum uninterrupted rest period of 24 hours plus the 11 hours' daily rest referred to in Article 3. The minimum rest period referred to in the first subparagraph shall in principle include Sunday" (emphasis ours). In its 1996 ruling, the European Court of Justice overturned the "Sunday" provision of the directive. The Court found "that the Council has failed to explain why Sunday, as a weekly rest day, is more closely connected with the health and safety of workers than any other day of the week." Supporters of the current work-free Sunday proposal maintain that the 1996 ruling does not rule out protection of Sunday as a work-free day. Instead, the 1993 Directive did not provide sufficient reason to explain why Sunday as a weekly rest day contributes more than any other day of the week to the health and safety of workers. In the new century several studies have been done that support a work-free Sunday as providing the greatest health benefit for workers. The European Commission will look at those studies as part of a new review of the working time directive. 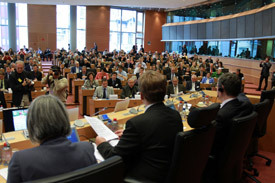 On March 24, 2010 a special plenary conference was held at the seat of the European Parliament in Brussels, Belgium to promote forging an EU-wide alliance for a work-free Sunday. The organizers of the conference were European Parliament member Thomas Mann from Germany along with the German "Konrad Adenauer Foundation." (The Konrad Adenauer Foundation is a German research foundation linked with Germany's conservative Christian Democratic Union party. The CDU traditionally supports Catholic social and family policies.) 67 different labor organizations and churches were listed as supporters of the conference. MEP Mann served as the moderator for the conference and introduced the guest speakers, among them László Andor, the new EU Commissioner for Employment and Social Affairs, and Roman Catholic Bishop Dr. Ludwig Schwarz, who as a professor was a faculty member for classical and Christian literature at the Salesian Pontifical University in Rome from 1985 to 1999. Following the short presentations by each speaker, questions and comments from the 400 conference attendees were presented. In his address EU Commissioner Andor emphasized the European Commission's intent to re-examine the working time directive and modify it as needed. In his words this issue is currently the most important item on his agenda as the EU's new Commissioner for Employment and Social affairs. Mr. Andor was careful not to make any commitment concerning Sunday becoming an EU-wide day of rest from work, but he welcomed input from the conference, including the submission of research data on the benefits of having a common day of rest for all of Europe. One consequence of the European Court of Justice's 1996 decision is that each EU member state decides whether it will legally mandate a "work-free" day of the week. Sixteen of the EU's 27 members have already provided legal protection for Sunday as a "work-free" day. However, a conference participant from the German city of Aachen highlighted the difficulties the current situation causes with its national determination of a "work-free" day. Aachen is located in one of Europe's "three country corners" where the national borders of several countries meet. Aachen is just a short drive from both Belgium and the Netherlands. Late last year Germany's Constitutional Court upheld a legal challenge made by the Catholic and Lutheran churches to allow "shopping Sundays," ruling on a clause in the German constitution that Sunday should be a day of rest and "spiritual elevation." The two churches sued the city of Berlin for its liberal practice of permitting an increasing number of "shopping Sundays." Germany's major labor unions also supported the successful legal challenge. The city of Aachen, located in a predominantly Catholic region, then banned "shopping Sundays" for the year 2010. However, just a half hour drive from Aachen, the Dutch city of Maastricht will have sixteen "shopping Sundays" this year. The conference representative from Aachen emphasized the need for EU uniformity on the issue. A couple of speakers included brief references to minorities who might want to have a different day of rest instead of Sunday. When the Muslim community in the EU was mentioned, conference moderator Thomas Mann responded by saying that the emerging "work-free Sunday" alliance had friends from Turkey – a predominantly Muslim country – who fully support implementing Sunday as a "work-free" day. Two questions from the floor also asked about the protection of religious freedom for those who preferred to have a different day of the week as their "work-free day." Those questions were not answered by any of the panel speakers. The March 24 meeting was the first in a series of conferences on the initiative to be held at the European Parliament in Brussels. At the end of March – just three months after a small group had met to discuss the feasibility of promoting an EU-wide "work-free" Sunday – 100,000 signatures had already been gathered in support of the petition. The majority of speakers at the "Protection of a work-free Sunday" conference were representatives of labor unions and organizations. However, even some of them referred to Europe's religious heritage of Sunday as a day of rest, dating back 17 centuries to Roman emperor Constantine and the year 321 A.D. In his opening remarks, conference organizer Thomas Mann included the "spiritual aspect" of life as an important part of a weekly day of rest, including attendance at worship services. Comments made from the floor referred to Sunday as the "seventh day of the week" and even as the "biblical seventh day." However, at the end of creation week God did not rest on the day called Sunday by today's world. Sunday is also not the "biblical seventh day." A glance at almost any dictionary, encyclopedia or calendar will show you that Saturday is the seventh day of the week, while Sunday is the first day of the week. According to God's calendar, the seventh day is – and always has been – the Sabbath day. Although man has modified calendars through the centuries, the seven-day weekly cycle has remained intact throughout history. The days of the week have always remained in their proper order, with Sunday as the first day of the week and Saturday as the seventh. Saturday as the seventh day of the week is easily proven by the life of Jesus Christ. If Jesus would not have kept the correct seventh day of the week, He would have sinned and would not have able to be our saviour. However, shortly before His death, Jesus said: "I have kept my Father's commandments" (John 15:10). Jesus kept the same day of the week as the Sabbath as His fellow Jews. Although Jesus had disputes with the Jews about how to keep the Sabbath, He was never accused of keeping the wrong day. 2000 years ago Jesus kept the Sabbath on the same day that God had instituted as a day of rest in Genesis 2. No serious calendar authority will argue that the sequence of the days of the week has been altered in the last 2000 years. That means that the Jews today keep the same day of the week that Jesus did 2000 years ago: Saturday. That day – from Friday sunset to Saturday sunset – is the only correct "biblical seventh day". It is the only day that reflects Jewish tradition regarding the Sabbath commandment, Bishop Schwarz's comments notwithstanding. So why do European church leaders and labor union representatives say that Sunday is the Christian day of rest and worship? The change from Sabbath to Sunday is not found anywhere in the Bible. It was made long after the writing of the New Testament. So how and when was the change made? Initially Christianity was viewed as simply a sect of Judaism. However, after Jewish revolts in Judea in A.D. 67-70 and 132-135, Jewish religious practices – many of which continued in the early Church – came to be viewed with hostility throughout the Roman Empire. Many among the Church began to abandon these practices, including observance of the biblical Sabbath and festivals. No clear references to Sunday as a day of Christian worship are found until the writings of Barnabas and Justin, around A.D. 135 and 150, respectively. Observance of Sunday as the primary day of worship appears to have begun to solidify during the reign of Emperor Hadrian (A.D. 117-135), who harshly persecuted Jews throughout the Roman Empire. Hadrian specifically prohibited practices of Judaism, including observance of the seventh-day Sabbath. These oppressive measures apparently influenced many early Christians in Rome to abandon the seventh day and turn to Sunday, the day for honoring the sun god among the Romans and other peoples of the ancient world. When Christianity was declared the official religion of the Roman Empire in the fourth century, the process accelerated. Roman Emperor Constantine, although a worshipper of the sun, was the first emperor to profess belief in Christianity. But the "Christianity" Constantine endorsed was already considerably different from that practiced by Jesus and the apostles. The emperor accelerated the change by his own hatred of Jews and religious practices he considered Jewish. For example, at the Council of Nicea (A.D. 325), church authorities essentially banned the biblical Passover observance. Endorsing this change, Constantine announced: "It appeared an unworthy thing that . . . we should follow the practice of the Jews, who have impiously defiled their hands with enormous sin, and are, therefore, deservedly afflicted with blindness of soul . . . Let us then have nothing in common with the detestable Jewish crowd" (Eusebius, Life of Constantine 3, chapter 18, quoted in Nicene and Post-Nicene Fathers, 1979, Vol. 1, pp. 524-525). In a bid to unify his empire, he established the first laws making Sunday the official day of rest. His A.D. 321 law, for example, stated: "On the venerable Day of the Sun [Sunday] let the magistrates and people residing in cities rest, and let all workshops be closed." Several decades later, the Council of Laodicea decreed: "Christians must not judaize by resting on the Sabbath, but must work on that day, rather honoring the Lord's Day [Sunday]; . . . But if any shall be found to be judaizers, let them be anathema from Christ." Within a few centuries observance of the biblical Sabbath was driven underground within the confines of the empire, and most who professed Christianity embraced Sunday. Although the Protestant Reformation brought some changes, observance of Sunday continued from the Roman Catholic Church into subsequent Protestant denominations. But whereas the Catholic Church claimed authority to establish its own times of worship, Protestant churches generally justified Sunday observance on the grounds that the seventh-day Sabbath was replaced in the New Testament by worship on Sunday in honor of Christ's resurrection. However, there is no biblical authority for changing the day of rest and worship from the seventh day to Sunday. All speakers at the March 24th "Protection of a work-free Sunday" conference in Brussels lauded the effort to provide workers in Europe a legally protected weekly day of rest. Even those conference attendees who voiced concerns about minority rights voiced appreciation for the concept of a "work-free" day of the week. As already noted, the main emphasis of the current initiative is on the social and labor benefits of a work-free Sunday. However, circumstances change over time, and what may not be as important now may become predominant in future years. There is an interesting prophecy in Revelation 13 where two beasts are depicted. One of them is able "to make war with the saints and to overcome them" (Revelation 13:7), and the other masquerades "like a lamb," but in reality speaks "like a dragon" (verse 11). This second beast performs miracles (verses 13 and 14), and he "exercises all the authority of the first beast" (verse 12). The second beast of Revelation 13 is a religious power, since it appears like a lamb and works miracles, although in reality it speaks like its actual source, Satan! The second beast of Revelation 13 uses the power of the first beast of that chapter to force people to worship the first beast (Revelation 13:12). In addition to forcing people to worship the first beast of Revelation 13, the second beast enforces a sign on the people who refuse to worship the first beast: "He [the second beast] causes all, both small and great, rich and poor, free and slave, to receive a mark on their right hand or on their foreheads, and that no one may buy or sell except one who has the mark or the name of the beast, or the number of his name" (Revelation 13:16-17). The language used – "right hand" [actions or behavior] and "forehead" [mind, thoughts] – is identical to the description God gave His people Israel in the Old Testament to describe what His law should be to them (Exodus 13:9; Deuteronomy 6:8). The mark of the Beast is evidently a mark of disobedience to God. Of all the points of God's spiritual law, the Ten Commandments, the one that is questioned or ignored most frequently is the commandment involving the Sabbath, which God intended to be a special sign for His people (Exodus 31:13). In fact, the Sabbath can be viewed as a test of a person's willingness to be totally subject to God's will for Christians. Many Bible students see the mark of the Beast as countermanding God's Sabbath. They believe that forced observance of Sunday – a day originally dedicated to the worship of the sun as a god instead of the observance of the seventh-day Sabbath – may be involved. This view is strengthened by the fact that other prophecies in the book of Revelation show a great counterfeit religious figure and system at the time of the end. This system will be centered in Europe and will play a major role in leading people away from the true God. Without accompanying legal protection for religious minorities in Europe, a successful initiative to declare Sunday as the European Union's official "work-free" day would have serious implications for those EU citizens who want to keep the true biblical seventh day of the week, God's holy Sabbath day.